The lovely Kate of Make Do Style scored some totally gorgeous 70s maxi dresses last weekend, courtesey of her very generous mum-check them out here! This fabulous haul of hers inspired me to go to my mums and collect my other 50s dress which has been languishing in her spare room. About ten years ago, this was a regular in my wardrobe, until the zip bust. I always meant to get it repaired, so ten years on, I think it deserves to be fixed up and worn again. The colours are very autumnal and I can't wait for it to be up and running!! 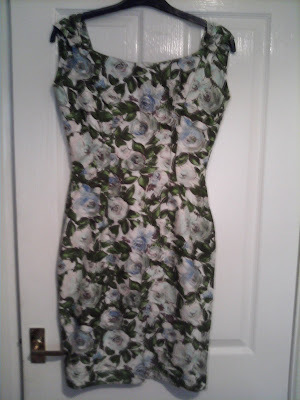 I also have a matching duster coat for this dress, wide collared and very 50s style-one for the summer months I think!! 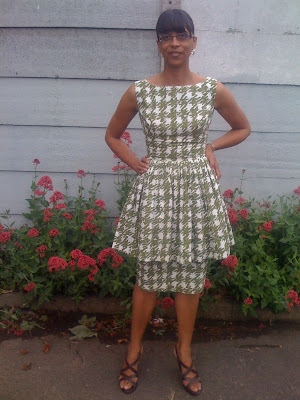 Here are the other two vintage original 50s dresses of my mums, now proudly mine!! Have Kate and I inspired you to raid your mums or grans wardrobe-go on, you could be in for a lovely surprise!!! My mom didn't save ANY good dresses, and she had some REALLY good ones. I do have a few pairs of shoes. I love your dresses. I have juts had one of my mothe rin law's dresses mad einto a tippet. Love the rose dress. And you look gorgeous and elegant in the black dress- the shoes are very glamorous too! Great dress and it has a duster coat! I'd be wearing them every day. i love that floral dress!!! gorgeous! you must repaired it as soon as possible! it's lovely! My mom and I couldn't be more different, both in body type and in style. How fun that you can wear your mom's dresses! I love that first dress of your mums and cannot wait to see the dress that needs the zipper fixed on you. And I wish my mum had kept her clothes from when she was a teenager. My grannie made all her clothes and photos of them are just fantastic! p.s. love the shoes in the second pic...who by, bella? What fabulous dresses! v lucky!!! 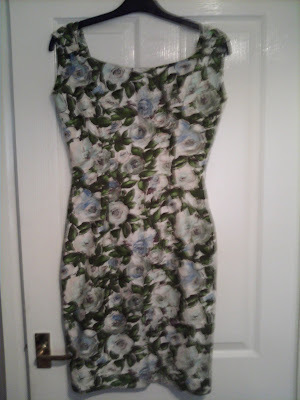 I've never raided my mums wardrobe, not that it isn't nice, but I don't think she's kept any items from over the years. Hi everyone-thanks so much for all your kind and lovely comments, as always they are very much appreciated!! Gorgeous! MY mum actually has an amazing collection of 80s cocktail and party dresses, including a KILLER purple velvet one. I used to think she was crazy for keeping them but next time I visit, I am SO stealing them! You're lucky to have a closet to raid for vintage items. I love vintage. Totally drooling over that peplum beauty! My mum hasn't saved anything :( Those dresses look amazing and as long as something is made of 'thick material' I am totally sold on the idea. My mum only saved me a couple of her clothes! I've seen photos of her when she was younger and wish she saved me her whole wardrobe!! I so love the floral print. Great stuff! The floral dress is just absolutely adorable and that black suit is perfect for a day at the office. Hi everyone-I'm so pleased with your lovely comments, thanks so much! how are you? how's the weather out there? when she was young. wish she kept them. but from now on, it gives me an idea to keep mr. freddy's clothes so he could pass them on his future children someday. wow! dresses are so beautiful. did your see you wearing her clothes already? tell her, she has a good taste. Those dresses are lovely! And I totally know what you mean by raiding your mom's closet. I have a blouse that was once my mom's from the early 80's! Oh my! You are so lucky! Great looks! And yes, good ideas, my mum left me som really good dresses, but I do wish for even more glam 70s outfits. Have a great weekend! I loveth that "plaid-ish" dress! Hi everyone-thanks so much to you all!! love these on you sharon,the black is fab! I like them all! Do the fabrics require any special care???? WOW! Sharon Rose YOU look 50's FABULOUS! Hi ladies-thanks so much for the lovely comments, to Rebecca, I would dry clean the black one, but the others would be a gentle machine wash.
My mom was quite the mod dresser in the 60s and 70s and although she was much tinier than I am (she was 4'11" and 85lbs! ), she saved a few items that I can squeeze into, like some awesome sweaters and a pair of dark-wash Calvin Klein jeans (which are capris on me, LOL). Hi Bonnie-thanks my dear!! Your pieces sound great, hope you get to wear them a lot!